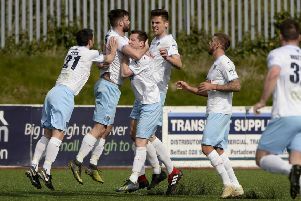 Wakehurst manager Ian Gregg believes this will be a pivotal week for his side in their quest for Belfast Telegraph Championship Two survival. The Ballymena men have two games at their adopted ‘home’ of Mill Meadow this week, the first against Portstewart tonight (Tuesday) followed by a crunch clash with Coagh United - who currently sit immediately below Wakehurst in second-from-bottom position - on Saturday. “This will certainly be a big week for us,” admitted Gregg. “We have two or three games coming up now which we have earmarked for picking up points. Gregg has a number of injury worries with defenders Niall Swann (foot) and Douglas Stevenson (back) and midfielder Ryan Gregg limping off in Saturday’s 1-0 defeat by Lurgan Celtic and the quick turnaround means Tuesday night’s game may come too quickly for them. On the plus side, Gregg will be able to call upon Andy Erwin and leading scorer Conor Gregg, who have both completed one-match suspensions, while midfielder Stephen Mellon is available after work commitments. Gregg was pleased with his side’s performance in Saturday’s defeat to the Championship Two leaders. “They are the likely champions so not many people would have expected us to win the game but in the end I came away disappointed that we didn’t get something. “We’ve played the top two, Lurgan Celtic and Limavady, in recent weeks and we produced two good performances and that is certainly something for us to take into the final weeks of the season. “Unfortunately we conceded our now traditional soft goal, yet again following a corner - I’ve lost count of how many times that has happened this season,” added Gregg. Wakehurst: Maybin, Swann (sub Gilchrist), Stevenson (sub Lemon), Colville, Price, Young, Gilmore, Crawford, Laughlin, R Gregg (sub Speirs), Foster. Subs (not used): Alexander, Parker. * Wakehurst hold their annual table quiz at Leighinmohr House Hotel on April 17, with a £500 first prize.